Something to Laugh About: Rhinebeck Fever! The Rhinebeck Sheep and Wool Festival this year was overwhelming! There was so much fiber, and so many people! I didn't get there as early as I would have liked (coordination with mom wasn't at its best) but it was worth diving through crowds to get to all the gorgeous hand dyed lovlies. The cream colored yarn is from a llama named "Mabsoot" from Philo Llamas. At 180 yards for $17.50, I'm hoping that it will be enough for wristwarmers for daughter #1 who didn't like my Recycled Wool/Silk (see previous post). The pink yarn is for daughter #3's new socks. She fell in love with the color and texture a 50% merino 50% tencel combo. You can't see from the pic but it has subtle variations of dark pinks. It comes from Ellen's 1/2 pint Farm in Vermont. She loved the hank so much that when husband and I tried to roll it into a ball it became a major operation of tangles... He's very patient and good at getting knots out! The olive green wool is from Sheepy Valley in upsate New York. I'm thinking about using it for a scarf for husband that I found in this Irish Hiking Scarf KAL. The truly yummy SuperKid Mohair comes from Mohair in Motion in Minnisota and owner Betty Todd had a shawl out on display - just a big rectangle. A great easy project for those days when I can't count. I'll treat myself to a funky shawl pin when I'm done and hopefully wear it to Thansgiving. The gorgeous handpainted sport weight 100% superwash merino in shades of brown and green comes from Briar Rose Fibers. I'm using it for a pair of socks for husband. 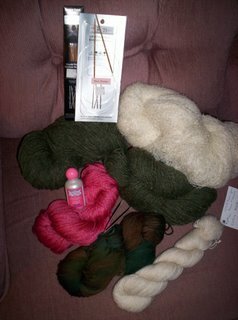 The needles in the pic are size 1s in dpns and 36" circulars, for all the sock projects I need to get to. These are impossible to find locally and I saved on s&h by finding them at the show. But the line at the register, Oy! Now I only worry that I'll snap them, since they are soooo thin.